Zamar Entertainment has just released the brand new video from Multiple Award winning Artiste, Globacom Ambassador/United Nations Peace Ambassador, Sammie Okposo titled "SYP (Sing Your Praise)", a major crowd favorite since its release and now the long wait for its much anticipated video is over. Directed by Pius Okaba, the captivating video for SYP was shot on different location sets in Johannesburg and Cape Town, South Africa. SYP was produced by Charles Duke and Sammie Okposo and it’s the third single from his upcoming new album which features earlier released songs, “Who Tell You Say” and “No Wahala ,Only Halleluyah”. 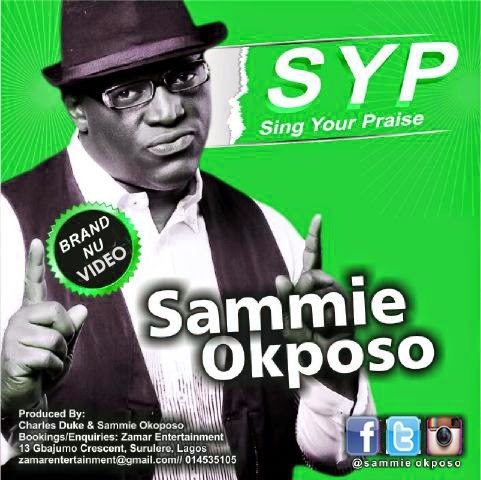 Sammie Okposo has also kicked off his 2015 Praise Party Tour with the recently held Lagos Edition in Lekki. The Benin edition comes up on his birthday, the 30th of May, 2015 with other cities & countries to be announced soon. Also in further celebration of his birthday on the 30th of May, Sammie Okposo prepares to release a 4th single titled “Mighty God”, an exciting collaboration with award winning soul singer, Nikki Laoye. Stay Tuned..the Praise Party Train is on the move!! !